MAS was honored to receive a special proclamation from Mayor Blasio on the occasion of our 125th year. The proclamation was presented by Sarah Carroll, the new Chair of the Landmarks Preservation Commission, during the opening reception of our anniversary exhibit Toward a Livable City. We are grateful to Mayor de Blasio and Chair Carroll for this recognition. 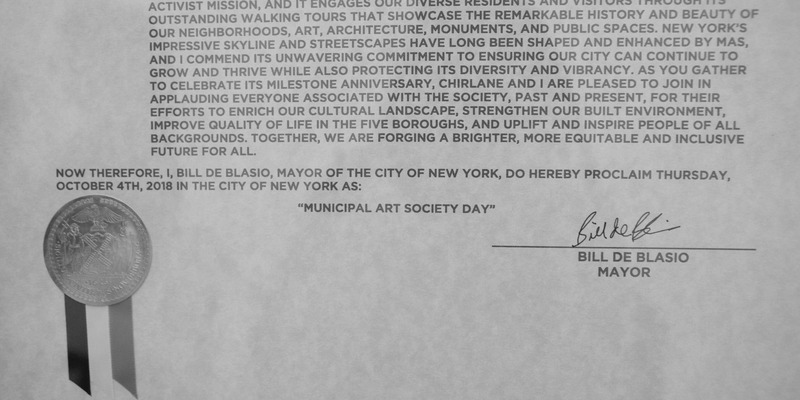 Read the full proclamation, which names October 4th, 2018, in the City of New York as “Municipal Art Society Day” below. Whereas: New York is fortunate to have an abundance of civic organizations committed to giving back to the five boroughs. A standout among them is the Municipal Art Society, which for more than a century has cultivated appreciation for our city’s iconic architecture and public art and monuments, advocated for historical preservation, and championed thoughtful urban planning and design in neighborhoods across the five boroughs. On the occasion of its 125th anniversary celebration, I am pleased to recognize MAS for its tremendous contributions to our great city. Whereas: Founded in 1893 by the acclaimed architect Richard Morris Hunt and other civic activists, the Society was initially guided by its mission to enhance life in our city by promoting public art and beautifying public spaces through projects such as a tree planting campaign. As the City and its population expanded rapidly in the early 20th century, MAS became more involved in urban planning, advocating for the construction of affordable housing and pushing for the passing of New York’s first citywide zoning code, the establishment of our City Planning Commission, and the passage of our Landmarks Law. Through its vocal advocacy initiatives, this pioneering organization has protected many significant buildings from demolition, including the Jefferson Market Courthouse, which is now a public library; the Tweet Courthouse, which now houses our Department of Education; Grand Central Terminal, one of our greatest architectural gems; and Radio City Music Hall, the world-renowned art deco theater. The Society was also instrumental in achieving landmark status for the historic theaters of Times Square, and its policy recommendations and reform efforts have fostered the sustainable development of buildings, infrastructure, and waterfront areas throughout the city. Whereas: By offering educational programs that empower New Yorkers to participate in the planning and development of their communities, MAS excels at advancing its activist mission, and it engages our diverse residents and visitors through its outstanding walking tours that showcase the remarkable history and beauty of neighborhoods, art, architecture, monuments, and public spaces. New York’s impressive skyline and streetscapes have long been shaped and enhanced by MAS, and I commend its unwavering commitment to ensuring our city can continue to grow and thrive while also protecting its diversity and vibrancy. As you gather to celebrate its milestone anniversary, Chirlane and I are pleased to join in applauding everyone associated with the Society, past and present, for their efforts to enrich our cultural landscape, strengthen our built environment, improve quality of life in the five boroughs, and uplift and inspire people of all backgrounds. Together we are forging a brighter, more equitable and inclusive future for all.